书籍简介: Ages 3-5. Lovable monsters provide a fun way for youngsters to learn subtraction in this latest entry in the MathStart series. The lively text and animated artwork are a good match for the young audience. 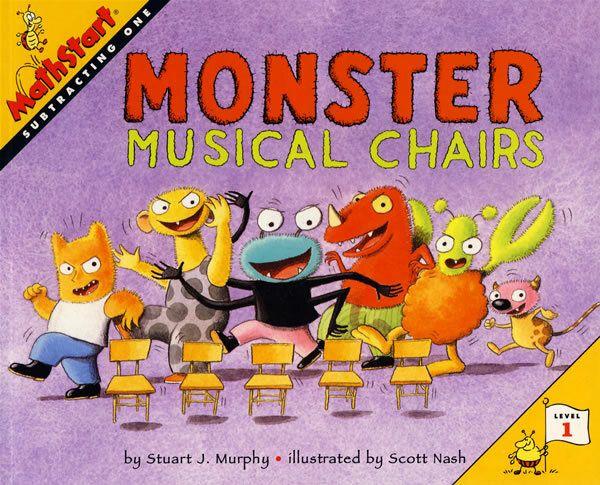 Murphy uses bouncy rhymes and simple sentence structure to describe how the musical chairs game works: \\\\\\\\\\\\\\\\\\\\\\\\\\\\\\\\\\\\\\\\\\\\\\\\\\\\\\\\\\\\\\\\\\\\\\\\\\\\\\\\\\\\\\\\"Six fuzzy monsters want a seat--see them rock to a monster beat. Five monster chairs all in a line. Sit in one and you'll be fine!\\\\\\\\\\\\\\\\\\\\\\\\\\\\\\\\\\\\\\\\\\\\\\\\\\\\\\\\\\\\\\\\\\\\\\\\\\\\\\\\\\\\\\\\" Meanwhile, Nash's silly pictures show the monsters in action, taking care to clearly depict the correct number of monsters and chairs for counting practice. Youngsters will love to join in the rollicking refrain: \\\\\\\\\\\\\\\\\\\\\\\\\\\\\\\\\\\\\\\\\\\\\\\\\\\\\\\\\\\\\\\\\\\\\\\\\\\\\\\\\\\\\\\\"Stomp, stomp, SNORT. Shake shimmy, SHOUT! When the music stops, one monster is OUT!\\\\\\\\\\\\\\\\\\\\\\\\\\\\\\\\\\\\\\\\\\\\\\\\\\\\\\\\\\\\\\\\\\\\\\\\\\\\\\\\\\\\\\\\" Faces of the monsters remaining after each round are pictured in a narrow column on the far right side of each double-page spread. Two pages of simple extension activities are also included. Lauren Peterson Copyright.